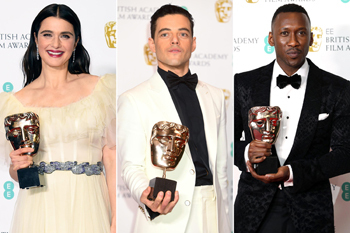 London, Feb 11: While 'Roma' nabbed the top prize for best film, 'The Favourite' took home the most awards with seven, including both actress categories for Rachel Weisz and Olivia Colman and best original screenplay. Rami Malek once again took home the leading actor award for his portrayal of Freddie Mercury in 'Bohemian Rhapsody'. 'Vice surprised with the award for best editing, while 'BlacKkKlansman' took home the best adapted screenplay trophy. British short film: '73 Cows,' Alex Lockwood EE Rising Star Award (Voted by the Public): Letitia Wright.